Looking to start a home business? Even if you live in a condo, apartment or smaller house, these business ideas could potentially work for you to start from home. Although VR has gotten off to a rougher start than initial futurists predicted, it is still a growing industry with significant potential for new businesses to enter. If you have a strong interest in learning how to program in VR or have some experience already, this could be a great business to start from your home. And if you are working with other clients, you can always go to meet them at their offices and do the coding and programming at your home. 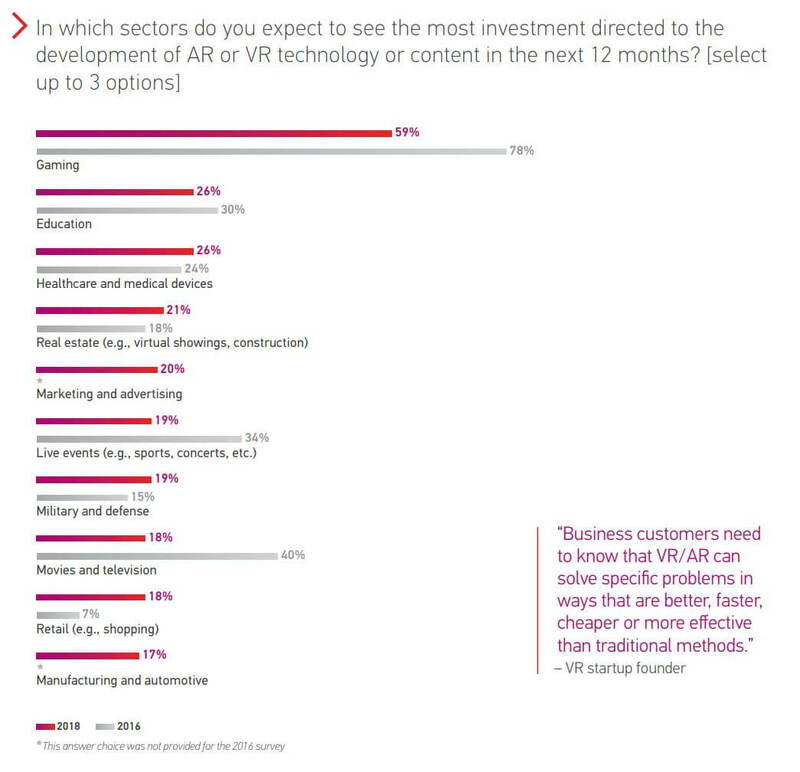 If you’re needing some inspiration of the industries to approach and what kind of virtual reality programming has the growth potential, check out the research below by PerkinsCoie. Are you an influencer looking to expand your business beyond your social media channels? This home-based business idea would allow you to potentially create a more stable income and consult others about building a personal brand just like you did. You could do this all virtually as well so you don’t need to worry about the liability of having clients coming to your home. If you already have a following on social media then that will help you kickstart your business with potential leads. If you don’t but are interested in starting this business idea, you could develop your own personal brand on social media channels and take the route of helping others who are just a bit behind you. As you grow, you’ll attract bigger and bigger clients. An event planner is a common idea among the lists about home based business ideas, so I wanted to take a spin on the idea. This company’s niche would be in funerals. Although it is not the most exciting and happy industry like party event planning, this solves a major problem of allowing the grieving people to have their space. The last thing someone who lost a loved one or friend wants to do is plan their funeral. Most of the planning here can be done from your home so you don’t need to worry about having an office. This consulting service would help other companies’ setup and manage their remote employees. Many employees now are demanding that they want to work from the comfort of their own home. However, some managers and executives are reluctant to give their employees computers to work from home, and often wonder if much work gets done. This is where you can come in and help them set up proper tracking software, server connection programs, and environments in the employees’ home where they can work so they are still working efficiently. Organization is a growing trend right now that should be here to stay, and if you’re a very organized person when it comes to your home, you could be helping others and start a business too. The professional organizer would consult with others on how they can minimize the amount of clutter they have, systems for organizing and teach their kids to organize, and worksheets to keep them on track for a few months so it becomes a habit. Again, these materials can all be made at home and the consultations can be done at the clients home as that is where the mess is. 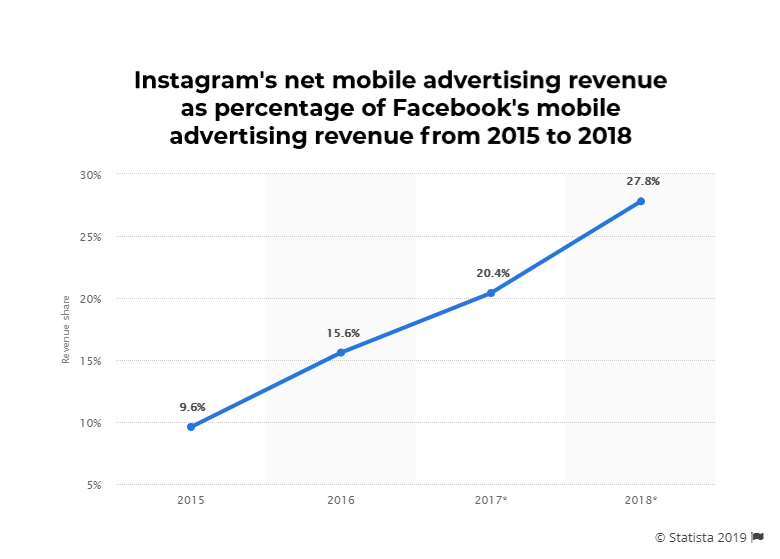 Although Facebook has had many scandals with their data in 2018 which have followed into 2019, many people are still using their platforms, and will continue to do so until something else comes along. A Facebook and Instagram social media manager would specialize in only those two social channels and help people (influencers) or companies and brands manage their presence there. If you know about making great content for those platforms, and love social media, this could be a great business for you to start from home. Although it is competitive with other marketing agencies doing similar work, your specialization will stand out for people who only want to use those platforms. Are you outgoing and enjoy doing sales over the phone or in person? If so, this could be a wildly profitable home-based company. The cold calling company would work with other businesses and make cold calls to potential clients on their behalf. For every call or for every client that signs up with that business, you would get a commission. In the beginning, it is a lot of selling. Not only do you have to convince clients to use your services, but you also have to convince others to use your client’s services too. But if you have a nice environment at home, this could be a great business to start. As a WordPress virtual assistant, you will specialize in helping other businesses or entrepreneurs manage their WordPress content systems. It can sometimes be a lot of work for unspecialized marketing teams to update webpages, articles and other plugins and updates that happen. That is where you can come in. If you don’t have much experience in this content system, it is quite easy to learn and navigate as well, so if you’re a beginner you can still start this business. According to research by W3Technology, WordPress has an overall 59.9% capture of the content management systems for websites. Kickstarter is a great platform for new and established companies to launch their ideas to the world and see if they can get funding to build their dreams. It has taken off in the past 5 to 8 years as a great platform to raise money for a new product business. However, with any platform, there are certain best practices and things you should and shouldn’t do. If you have an interest in Kickstarter and want to learn how to launch successful campaigns, this would be a great company to start at home. Many places in the United States are requiring the internet customers to plug in the wires at their home when they receive the internet box. However, most people don’t set it up properly so they have the best range throughout the house, or their house might be so big that it needs more connection points. This business would optimize that for people. Since your inventory would only really consist of wifi-relay points, you can store this at home with your installation tools. Online tarot reading can be a really fun business to start from home if you’re interested in Tarots. It is a different approach than bringing someone into a place to do the reading, as you would do the readings online over a video call. However, there are others doing this so it is possible and could be a great idea to try and launch. As the years go by, more and more people are looking to life coaches and consultants to help navigate the difficulties in life. Whether it’s help with your career or your relationships, a life coach can help. And if you are currently a counselor or therapist or want to become a life coach, you can do it all at home with this business idea. 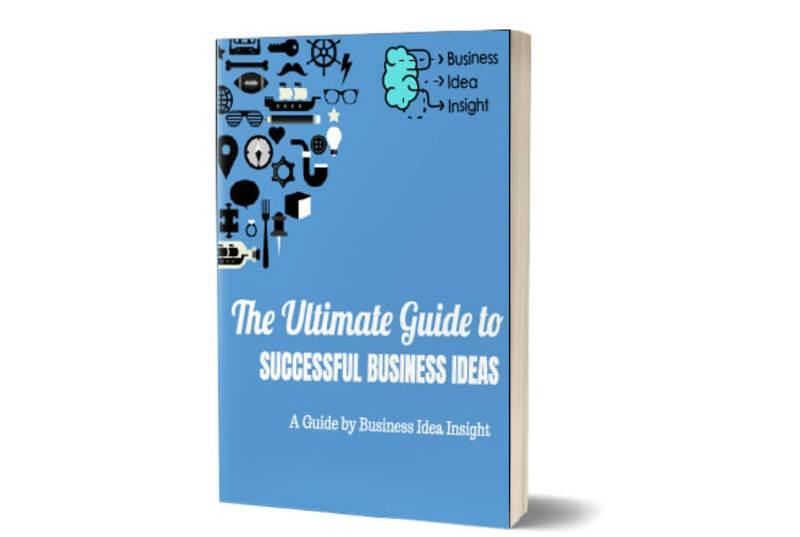 Subscribe and get instant access to exclusive business idea guides, strategies, and tips. 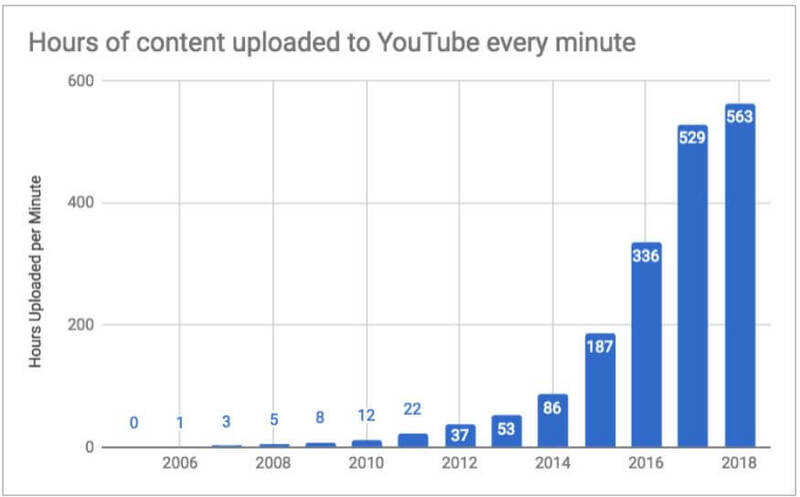 More and more people are wanting to start and run YouTube channels as a way to express themselves, but also as a career aspiration. If you have experience editing videos or want to learn and turn that skill into a business, this would be a great niche to choose. As well, since this is a growing market, you’ll always have a new list of potential clients that you can interact and reach out to. Lastly, this can be run from the comfort of your couch or desk. Have a passion for knitting clothes but want to make some money too? Well you could easily start a knitting business. By setting up a website where people could upload the custom designs they want made, you could take custom orders to make for clients. Planner inserts are growing in popularity among influencers and related brands, as it’s a great way to add value to the customer or potential customer, without spending a lot of money. This company would design these planner inserts according to that person’s personal brand and sell them. Or they could teach others how to make them and sell them courses based on how to make it great and at a low cost. Mail pranks have been blowing up over the past few years. They are a hilarious way to prank a friend or foe in an unexpected fashion. By setting up a simple website where people can enter the address for where the prank will be delivered and the type of prank (could range from a glitter bomb to a funny message). Then you can charge a simple fee and prepare the package, put it in the mail and collect. All from the comfort of your own home. Interested in making bath bombs from your home and selling them in public markets? If so, you could take a unique approach and use a 3D printer to print cool and interesting molds for the bath bombs, allowing you to stand out from your competition and offer a unique product. You could even take a different approach and start a website where you take specific requests from people about what kind of designs they want, and then ship it to them. Online dance instruction classes are taking off by storm. Not only does it allow people to save time from communicating back and forth from a dance studio, but they also get to learn from the comfort of their own home, away from others who may make them uncomfortable. If you have experience teaching dance or have been dancing for years yourself, this could be a great online business to start. And the great thing about this is that you can do all the filming from your home. If you show how you can teach and do dancing in your home, others will feel more comfortable like they can too. Beards are still in style, and it doesn’t look they will be going out of style any time soon. One product that most men with beards have is beard oil. It makes the beard look nice and it can help style it so it looks cleaner. The great thing about this idea is that you easily make the beard oil from the comfort of your home and you can do it with chemicals like some companies or do it organically. 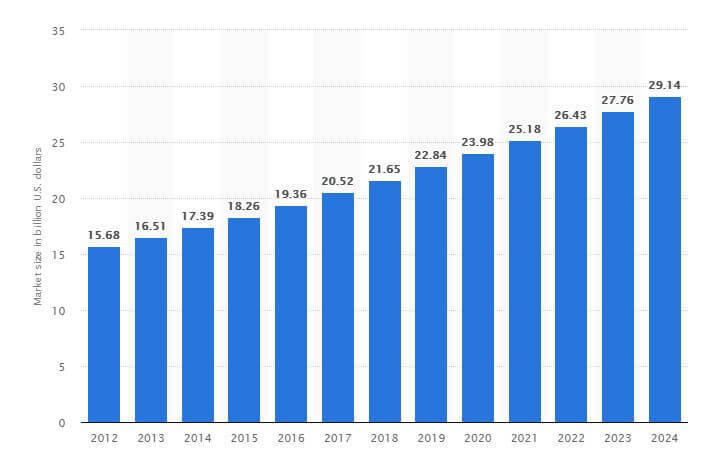 And, as you can see from the chart below by Statistica, the male grooming market is going to continue to have steady growth continuing into 2024. Are you in IT or computer savvy and want to run your own servers for others websites? This can be started from home if you have a good sized closet you could house some fans and servers, as well as a good sprinkler system installed to avoid a fire. Then you’ll most likely need to go out an network with other business owners and website managers to see if they’d like to switch to your hosting for a faster local connection, potentially. Chicken, McDonalds, hot chocolate, and many other things can all be ordered using delivery apps that have been popping up over the past few years. However, one thing that is usually not accessible for delivery past 5 pm is baked goods. In many cities, the bakeries close early, as they open early, so food delivery companies are not able to pick up food if you wanted it in the evening. If you could get your kitchen approved for baking, you could have the bike couriers come to your place to pick up the baked goods, and do all the baking from your home as well. Luxury clothing such as Supreme has a high resale value. Some people who buy original shirts and sweaters can resell these products for double or triple what they originally purchased it for. This is because many luxury clothing and handbag companies produce only a limited amount of a collection, and if you are able to buy one of the limited editions of their products, others are willing to pay more for it. If you don’t mind waiting in long lines for product launches and have the cash to pick up an expensive piece of luxury clothing or handbags, then this could be something you could start. By starting a website and networking in the communities that have money, you could buy these luxury items and post them for 50% to 100% more than the purchase price. Many people who need personal assistants can’t actually afford one as they are expensive. However, if you change the platform so it’s all done online and not in person, then it can be much more cost effective and you can offer this service to a larger market. By making your personal shopping services online only, you’d be able to order all the clothes, accessories, and items you need right online from your house. Customers would give you lists of the things they want or list of the events they are going to and you’d do all the buying for what they need for their events. “Luxury brands can no longer deny the influence of younger consumers. Generations Y and Z accounted for 47% of luxury consumers in 2018 and for 33% of luxury purchases. However, they contributed virtually all of the market’s growth, compared with 85% in 2017.” (Source). These days, many home security systems can be checked from the convenience of your computer or phone. Not only that, but people are moving away from using traditional companies to monitor their home and instead of installing their own personal cameras to monitor their property. By starting an online home security monitoring company, you could monitor peoples self-installed security cameras for intruders and the unexpected while they are busy working or living their life, all for a simple monthly subscription fee. One barrier to entry to think about if you’re interested in this idea is gaining the trust of others that they can trust you to monitor their security cameras in confidence. Looking to get crafty instead? This home-based business idea will allow you to do just that. If you want to refinish old furniture or you have space to manufacturer some, handmade home décor is growing in popularity as others look for these pieces to add originality to their home. You could sell them at marketplaces like flea markets, or you can setup a website and do online marketing to get sales. If you have a passion for luxury handbags and enjoy being around them, you could offer a handbag cleaning service. This could be done at the client’s house, or you could request to pick up the bag and bring it back to your place for cleaning. You’d need to be very careful doing this work, but you could charge a decent rate as careful attention to detail is needed for this business idea. Have anyone of your friends or family wanted a custom calendar designed to their specific interests? If you’ve noticed this demand, it may be time to start a calendar business. This could easily be started from home, all’s you would need is your computer and some free software for designing calendars. Hi Maria. Many of these ideas don’t require funding. I also recommend to not raise money if you want to start a home-based business as it will be harder to find investors. Also, if you do end up raising money, you will need to expand and get employees which cannot be held in your home.